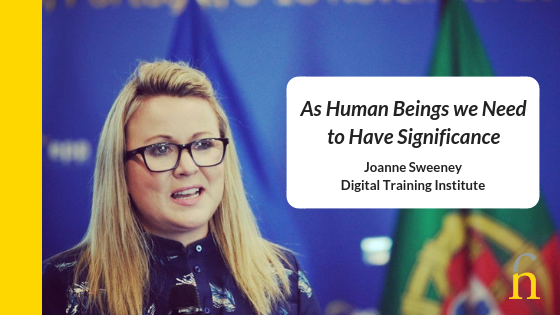 Meet Joanne Sweeney, CEO of Digital Training Institute. She is a former broadcast journalist, PR lecturer and CEO in various roles. Apart from being a busy entrepreneur she is also a published author. See www.lawenforcementobserver.com. She is an international speaker and a highly sought after digital marketing trainer. The thing that always strikes me about Joanne Sweeney is her drive to accomplish whatever task is at hand. She has the true Grit that’s necessary to succeed as an entrepreneur. She has a story worth telling and she was brave enough to tell it. 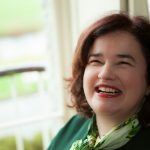 She shared this deeply personal story in her Tedx Talk in TEDx Omagh. This is her Entrepreneurial Story, or a little bit of it anyway. Key Insights here are in her ability to just work through every obstacle. These are not even in her vocabulary. Have a look and take a listen. You’ll be inspired and you will learn something you can apply to your business blueprint. The thing I loved about this interview with Joanne Sweeney was that she has never stopped in her blueprint for fulfillment. She embodies her own story and works tirelessly in pursuit of her vision. Yes, it might have evolved over the years but at it’s heart… at the core… her vision has remained constant. If you take anything from this interview take that! Here are Joanne’s 3 main pieces of advice for entrepreneurs; all worth taking. Number One has to be Ask or Help. Number Two I would say is, get Stuck on your Vision. Where do you want to be? I find it hard to do the long term visions. I struggle with that. But even 12 months, 24 months, and have a road map for yourself. Just mark out key milestones. Don’t worry about the how-to.Again, ask for help because we know in all the networks that we’re in Finola, once you ask people will respond. We’re very generous with our time. And then Three I would say, Constantly Learn. Every day is a school day for me. I’m not finished learning. The more I learn, the more I become better but don’t make the mistake of over consuming at the risk of under producing. We need to produce to make money, and we’re here to make money. Thank you Joanne Sweeney, for sharing your inspiring story with us! Full Transcript of Interview with Joanne Sweeney. Finola: Hi everyone. Welcome to the inspiring Entrepreneur series. I am proud, honored, and entertained also to be introducing you to Joanne Sweeney. I want to tell you that I’ve come across Joanne over the years because we’re both lovers of marketing. Finola: I always find you so inspiring, and so practical. And I like this. I’ve read some of your stuff and you always like to focus on three deliverables. You just have this great story and great way to make things more accessible and easy for people to understand. Finola: Joanne is a former broadcast journalist, PR lecturer, CEO, entrepreneur, author, and also quite famously, a Tedx speaker. I have to share with you, I’ve just been saying this to Joanne that, I was very, very moved by her TEDx talk. I just sat with it and it is worth watching. Finola: Her difficult story was a very inspiring story and at the crux of that story is a voice. And voice as a brand lover, voice is so powerful and important. On that note, I want to hand you over to Joanne because I’d like to hear you speak about your story. Some of it is TedX. Finola: I’d like to hear your entrepreneurial story because that is also extremely inspiring because you’re extremely prolific. You just go for it. You just keep your head down and you keep going. You have this grit and determination. I should stop waffling now and I will let you speak. Joanne: First of all, thank you so much for having me on your entrepreneurial series. I am honored to be here and to hopefully reach a new audience. I feel very lucky. Thank you so much. Joanne: Sometimes people say, Joanne you’re inspiring. I don’t anymore discredit that comment because if somebody says it, they mean it, and they mean it wholeheartedly. I guess saying I after watching my TEDx talk, then I really should take it on board because that was one of the most difficult things believe it or not that I have ever done was deliver that TEDx talk. Joanne: I think you could tell that I was nervous, and I was being vulnerable, and it is not something that I am very good at because I’m always happy and smiling and actually it’s the truth. I wear my heart on my sleeves but not very often I would go into the personal stuff so much. Joanne: If you’re going to watch my TEDx talk, which is my pinned tweet you can also Google it. It’s on my YouTube channel. It’s called, Upspeaking- Standing Up To Talking Down. It’s about how I found my voice eventually after not finding it and not using it, and then discovering it. Joanne: It’s interesting because I’ve always been a storyteller. That’s my trade, that’s my craft. Starting off as a broadcaster. When I was 13 I wanted to be paid to tell stories. I wondered what could I be. Then I said I’ll be a journalist and that’s what started off my career and I did become a journalist. I worked in radio. It was so empowering to sit behind a microphone and to have 60 odd thousand people listen to me every day who were tuning in and it was news. Up in Donegal, in Highland radio. I just felt a huge sense of something bigger than me. Joanne: We know in life as human beings we need to have significance and that gave me the significance that I never really had. Finola: Hold on. That’s important because we don’t always know that we need significance. We don’t know that. Joanne: Okay right. Maybe it’s a recent discovery for me. Finola: I think that’s a powerful message, because we do have our own significance to bring. Joanne: Yeah we do. In my world my significance hangs off the fact that I’m a mother. So proud of having two amazing children and grateful every single day. I recently listened to Tony Robbins YouTube video on my travels and he talked about the blueprint in our lives. Joanne: He said, When we’re young we create this blueprint for ourselves and sometimes we don’t have happiness or contentment because we haven’t fulfilled that blueprint. I took a step back and I went, what was the blueprint I wanted? I realized I wanted unconditional love and I wanted to be fulfilled. Finola: When did you realize that? Joanne: January of this year. Finola: As also a mother, I think deeply about this because we help shape the blueprint. Joanne: Absolutely. My children will have a different blueprint than I had. Again, if you listen to the TEDx talk, being a good mother was something very important to me and I wanted to excel at it. I think I’m doing a good job. You need to ask Sophie and Bobby their opinion. Finola: You already are. I can tell. Joanne: Then the significance I get from my work is being able to have my voice and to use it. Finola: Can I interrupt you? There’s an interesting point when you go from broadcaster to entrepreneur. What is the tipping point or the piece that flipped you into that? I know you have an Apprentice kind of appearance like a zillion years ago. But what was the point where you thought, it’s time now to be an entrepreneur? Joanne: I remember the moment. I remember I left journalism after three years when I didn’t get a promotion on my own show. Or to do an investigative documentary series. When I couldn’t go any further, and I was hungry, and ambitious to learn more and I couldn’t get it, I left. Joanne: Then I got a job as CEO with Letterkenny Chamber Of Commerce and became CEO at 24. I managed to increase their membership by 200 percent. Basically I created the job for myself. Joanne: Then I was like, business, sales, how did you do that? But it was by virtue of my good communication skills and engaging people, and showing them the benefits. Some people came to me and asked me to do PR on the side. I needed a separate brand. Joanne: My first PR brand was, Red Communications in the early Noughties (2,000’s) and got myself an accountant and all of that good stuff then. I had been dabbling in it but I had the security of the job. Joanne: I remember at this stage Sophie was five or six years old, so there was no way I was going to jump. It actually turned out to be 2008, so this is my 10th year anniversary of being in business. Joanne: I’m excited to make the jump. I left a €90,000 job. I felt the time was right. I felt I had the courage to do it, and that was the only thing I can say was the tipping point. I wanted to do more and I knew that being self employed would allow me to do it. I jumped and it was October 2008 and the timing was absolutely rubbish. Finola: I want to ask you this question because I know there’s this rubbish time. The thing that always strikes me when I think about you is that, there is this drive. It appears to me, there is this belief that you can do anything. Joanne: I believe that hard work pays off. I believe that my only obstacle is myself. And that I’m not afraid of a challenge. And I’m not afraid of hard work. You mentioned The Apprentice, that’s why I excelled. People got afraid of the tasks. I was like rolling up my sleeves, going can we start now? Joanne: I guess that’s because I was a forced entrepreneur as a teenage mother so I was providing at 17 years of age for me and my daughter. By washing dishes by going to school, by actually getting off the bus at half 4, starting a job at 5 O’Clock. Working until 10, coming home making bottles, doing homework. Joanne: I think that grit that I have stems from years ago. Now I kind of look at the circumstances that come along, and the toughness that happen to all of us and I go, I can do it, I’ve done something else worse than this before. I hold my nerve very, very well. I’m good at holding my nerve and remaining calm. Finola: Is that the thing? You say the hard work and I completely agree because it doesn’t work without the hard work. There is no overnight success. There’s an overnight success after that old 10,000 hours. It doesn’t exist and people think it’s just going to arrive. It is the big lesson that entrepreneurs face when they start. It is a rollercoaster. It is hard work. But is there something else? Finola: Hard work big lesson I think from this conversation and any conversation about entrepreneurial success. But the belief and the lack of limits. You’ve moved how you’ve positioned yourself several times throughout your career. I know it’s storytelling is at the hear t of it. There’s this solid heart in it. But I’m interested in, what’s the bit that you think? Yes, grit and nerve but there seems to be this belief or something. Joanne: You’re helping me tease it out as well. I don’t have amazing self confidence believe it or not. But I think that’s quite normal that we judge ourselves. We have impostor syndrome. We think we’re not good enough. I think perhaps it’s more of a female thing than a male thing. That’s just my own personal, opinion. Joanne: I think I’m a bit of a visionary and for me I always see the end goal. I don’t know how I’m going to get there but I’ve realized I don’t need to know the how-to. It will figure itself out. Finola: Hold. Say that sentence again for everybody because this is so important. Please. Vision. Joanne: I see the vision. I see the goal at the end of the road. I can see the road, I know it’s long and I know there are gonna be hurdles but I don’t think about that. I trust that the how-to, so how I’m going to get there, and figure it out along the way. Then I just go and I go with it. I take basically one step at a time. Joanne: If you saw my Snapchat during my first half marathon last March 2017, and I came last. I was Snapchatting every mile because I took one mile at a time. I had the run of my life. It was amazing. Coming last was kind of irrelevant. A bit embarrassing at the beginning but now it’s great story. Finola: It’s your perspective. You were the first at the other end. Joanne: I was running the longest. I was like running for three hours. That’s a huge achievement. Finola: Well done. Bravo. It’s something I talk about to clients a lot and about the entrepreneurial journey because if you don’t hold that vision strong in your mind, you will waiver. And meandering makes that rollercoaster ride longer. Is there something that you do, that keeps the vision in your mind? Finola: I kind of find it interesting because before we started officially recording this, you said, Do you know what my vision is? Joanne: Oh so I did. Finola: Yes you did. This is clearly your message. Is there tips that you can share with entrepreneurs to keep that firmly in their minds? Joanne: You have to be able to visualize what that vision is. For me, I write a lot so I always have a notebook and a pen. I have Evernote on my phone, which syncs up my laptop. And I am constantly writing down the many goals that will help me to get to the big goal. Joanne: A common phrase is, you can’t eat an elephant in one go, you break it down. I’m a huge believer in those small tasks because I’ll suffer overwhelm as well. But I break down the tasks. I’m really good at prioritizing in every aspect of my life. I don’t let distractions get in the way. They have no room. Joanne: We all have the same number of hours in the day. We have to be single-mindedly focused. But at the same time have an open mind to when things are going wrong or when somebody wants to give you advice. And don’t mistake advice for somebody pulling at your grit and pulling you down. Finola: Explain that to me. Joanne: Lots of people will have opinions and now in the world of social media, everybody has an opinion. Listen to your gut to understand what are the opinions that you should take onboard. I will ask for advice and opinions and I’ll gather them up. Joanne: But ultimately I listen to my gut and weigh up the context of your own situation and make a decision. If it’s wrong, it was my decision. But I won’t be taken down a road where somebody has no business taking me down. It’s only an opinion at the end of the day. Finola: I think it’s that hard lesson that we learn is to know when is the time to listen to advice? And when is the time to stay focused? When you start in business, you can start to self doubt a lot at the start. And to actually build up the trust in yourself that your gut is right, is a big thing. Finola: For me also, that is my check. Does it sit with me? Does it feel right? I don’t get so concerned with, everyone has an agenda. It can be a positive agenda, it can be a negative agenda. But it’s irrelevant in your story. It just means, does this ft? For me that’s how I do it. Joanne: Yeah, it’s okay to say no to somebody. I’ve had to learn that too. I would be always be tempted, I’ve got to do this for this person because it’s easier to do it than to say no, or to just not take their advice, or whatever it is. That takes practice and I’m still practicing it. Your gut is your second brain. Joanne: Who knew? I knew, again recently all these new discoveries I’m making. It’s your second brain, it’s there for a reason. If we ask ourselves in any aspect of our life when has our gut been wrong? Or when did we have regrets when we didn’t listen to our gut? Finola: The other interesting thing about you Joanne, is that you always remain constant in the story telling and voice area. Now you just moved into a new area for social media training, which is in public sector. You moved from what we would see as the normal marketplace for social and digital, which is with entrepreneurs in business. And you’ve just done a – 360. Joanne: So what, you’ve noticed? Finola: I’m also inspired by this because it’s so needed. It’s carving out a new territory for you. Tell everybody what you’re doing because it’s really interesting. Joanne: Yeah, in the process of launching Public Sector Marketing Pros. It’s an online hub, but it’s going to be launched with an event on June 14th in Dublin’s Mansion House. Starting as I mean to go on to wow people. Basically it’s digital marketing and digital communications for public sector marketers and communications professionals. Joanne: Why? Because you’ve already said it. They absolutely need it. Joanne: They would also admit that back. For us as entrepreneurs, we go straight into it. They have so many limitations. For eight years there were limitations on employing people, investing in people, recruiting new people, and developing systems because we had the recession and the public sector pay bill, and the associated bills had to go down. Joanne: The other thing is that because I’ve always worked alongside in my career with the public sector. So as a journalist I reported on local government, on criminal cases, worked closely with An Garda Siochana then working in the Chamber Of Commerce, obviously I was lobbying local government and national government on a range of issues. Joanne: I realized I guess after a year, year and a half that going exclusively into the world of policing and digital was too, too niche because they’re still so far behind and only a small group of people within a force would have responsibility. Joanne: It got me thinking last year about broadening that niche into the public sector. It’s been on my mind for three years but incessantly I guess for about 18 months. Now you will see it coming to light online. Finola: Tell us where people can find out more about you. And I want you to leave everybody with three pieces of advice as a fellow entrepreneur. Something like lessons learned for you. Or if you had your time over again, or you had Sophie beside you, starting out her own business, what would you say to her? Joanne: You can find me anywhere. Just type in Joanne Sweeney Burke into Google Search and connect with me on LinkedIn and Twitter. I’m on Facebook, Snapchat, and Instagram. My website is digitaltraining.ie. Any public sector marketers out there you can find me at publicsectormarketingpros.com. Joanne: Three tips because you know I love the power of three. Joanne: Number two I would say is, get stuck on your vision. Where do you want to be? I find it hard to do the long term visions. I struggle with that. But even 12 months, 24 months, and have a road map for yourself. Just mark out key milestones. Don’t worry about the how-to. Joanne: Again, ask for help because we know in all the networks that we’re in Finola, once you ask people will respond. We’re very generous with our time. Joanne: And then three I would say, constantly learn. Every day is a school day for me. I’m not finished learning. The more I learn, the more I become better but don’t make the mistake of over consuming at the risk of under producing. We need to produce to make money, and we’re here to make money. Finola: Wonderful. I love it. Let us leave on that note. And Thank You so much for your time. It’s been a pleasure. Finola: Take care. Bye Joanne.